I recently was befriended by three new crystal friends that were eager to come home with me. These included two I was already familiar with, but the addition of a third I’d not seen before. I always like to share about crystals, as I know many of you also have a great love and reverence for them like I do. The first Crystal is a Tantric Twin Lemurian Seed Crystal with Rainbows and a Timelink to the past (I’m still in exploration on more this powerful beauty has to share). 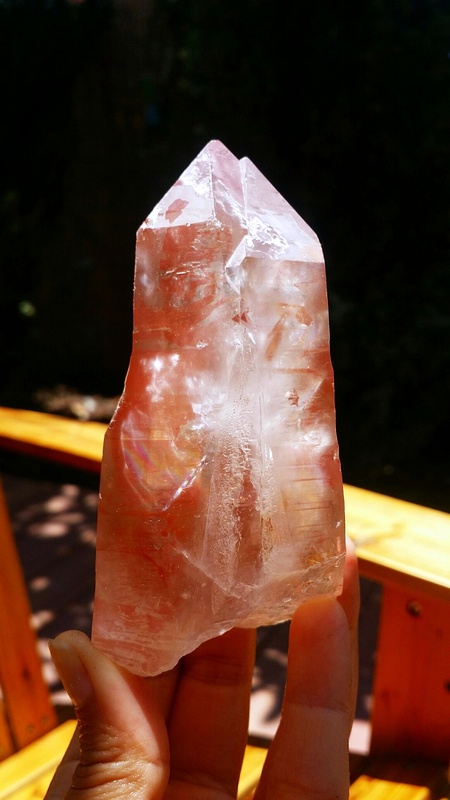 Such a lovely and large Lemurian of this family of crystals. I have already four of these and so this last one rounds out to my favorite number – five. Twin energy seems to keep coming up for me. Tantric Twin seems to be a metaphysical name these Master Crystals are known by, but they are also simply Twin Crystals. 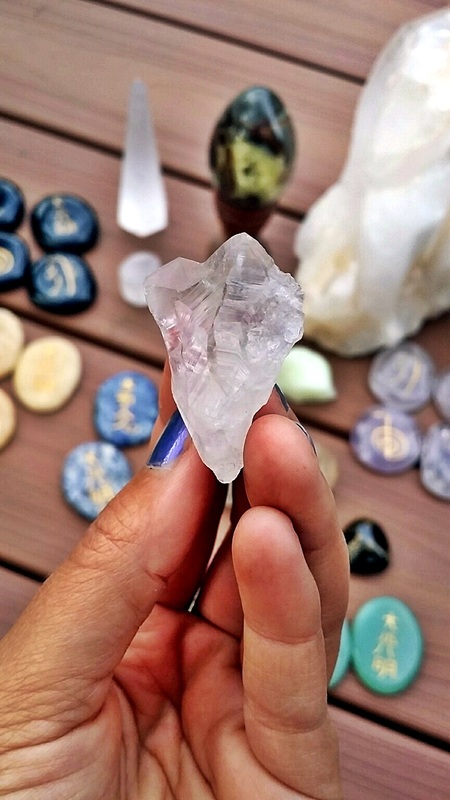 Twin Crystals help in building relationships of all kinds and can be used in meditation to receive clarity and insight on hidden challenges within relationships and the ways in which you can heal them. They can directly help you to heal things in your relationships or even the relationship with yourself, as well as support relationships build on solid foundations. They can hold space for tough conversations within your relationships, to assist in communicating more from the heart and with compassion, patience, and loving presence. When rainbows appear in the Tantric Twin Crystals, as with mine, this is very useful to project healing energy into the relationship, infused with lightness, joy, and optimism. Tantric Twin Crystals are two of the same length (or nearly the same) growing together from a single root/common base and work with the energy of Soul Mates or Soul Partners (people your soul is connected to that assist with mutual soul evolution – these can be friends, romantic, family, co-workers and you can have many), Twin Souls/Flames (two parts of the same soul that split into Divine Masculine and Divine Feminine that feel like completion when they come together – not necessarily different genders but more Yin/Yang relationships that complement one another rather than being exact duplicates), and romantic relationships, but also help us attract like-minded people, and to work with that Twin energy within each of us of our Divine Masculine and Divine Feminine in wholeness. They will also bring energy to help strengthen and deepen the relationship we are already currently in and enhance connection within the special bonds we have. There is no separation or true boundary between the Twin Crystals. 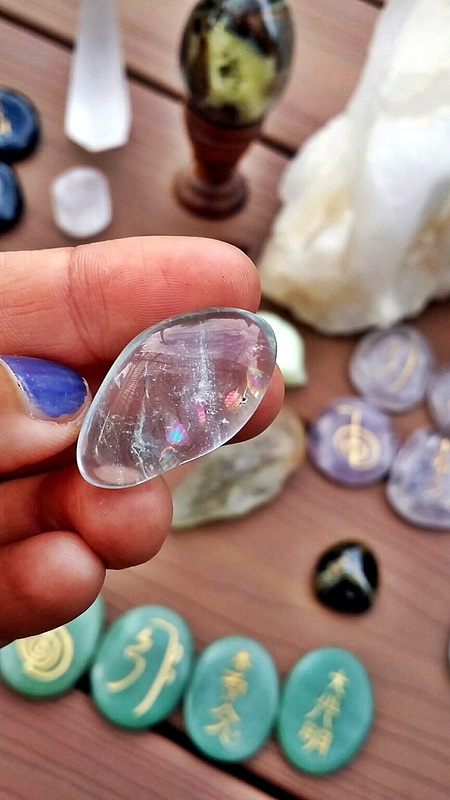 The second Crystal to share is one I’ve also written about before – a Tibetan Quartz with Rainbows. I have one other one of these, so now they each have a friend. This particular one is a Self-Healed Crystal (meaning it will assist in healing of the self on all levels since it contains the wisdom of how to do this) and has an alive, moving water bubble inside, which you can’t see in the photos. I have one other Crystal like this – a Herkimer Diamond. Having the millions of years old trapped water bubble makes it a special healer to work with the emotional body and your deepest essence self. It will help illuminate and stimulate the ability to see in the darker parts within self, face fears, remove emotional and energetic chords, release old emotional patterns, and understand the layers of who you are in a core way. 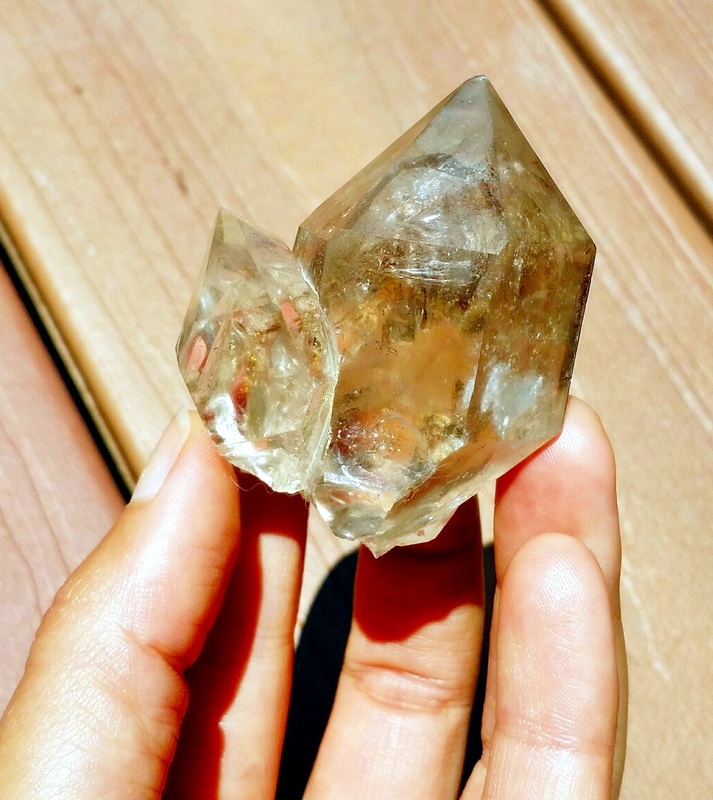 This new Tibetan Quartz feels like a mother and child energy and so it mirrors the connection I have with my two bunny loves and even with this aspect of self-nurturing with my own inner child I’m engaging in a new way right now within my self. There is even a very tiny small growth underneath that is beginning to birth from inside the mother – you can actually see the core of it inside the mother and then the outward protrusion stemming out. And another small point that seems to not only have grown at the bottom, but at some point might break off. 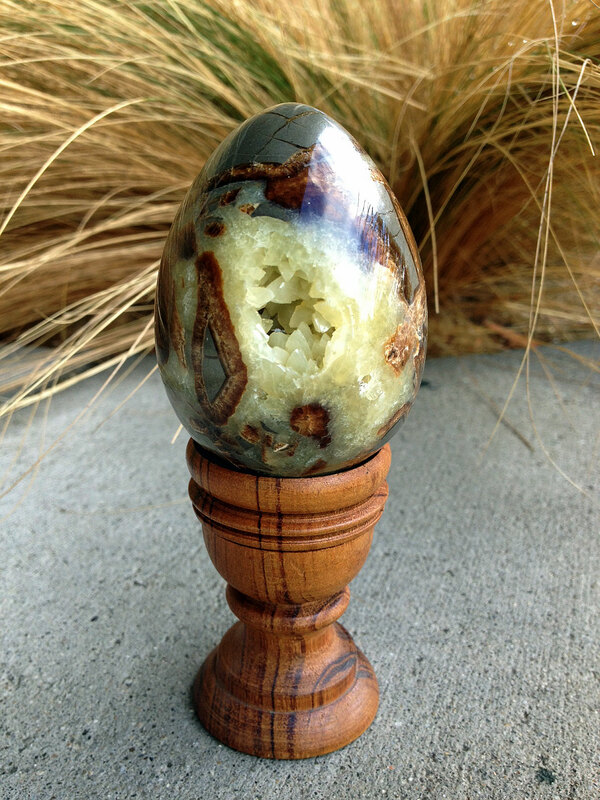 It’s a very birthing with creation energy crystal and full of nurturing love. All really awesome energetically for new growth, expansion, abundance, fresh opportunities, and rebirthing. And the third and last Crystal to share about is my new find (at least new to me). 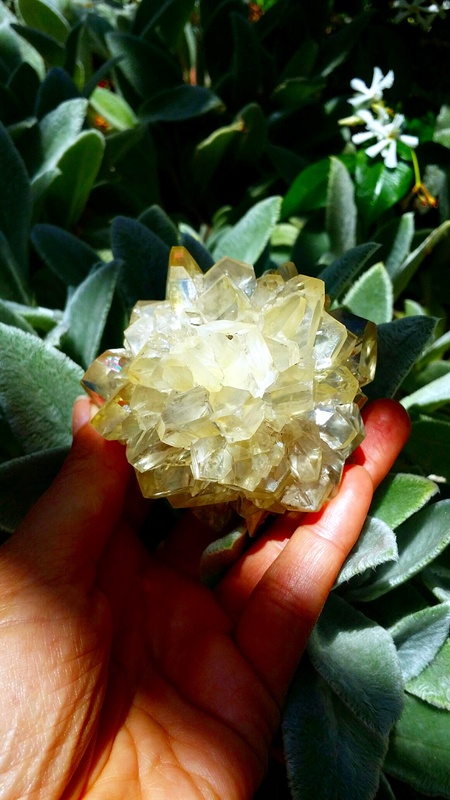 It is a Golden Selenite Flower and is so amazingly Cosmic and magickal, I get chills each time I pick it up and did right away when I saw it. The first one I picked up of the ones I saw was the one that came home with me. It is also known as Golden Ray Selenite. If my memory serves me correct, which I can’t rely on these days, I think I remember the woman I purchased it from sharing that this particular kind comes from Canada. 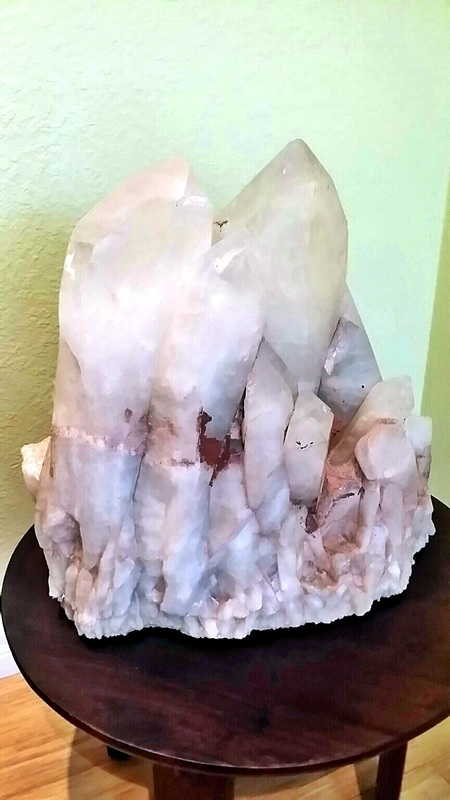 This is a completely natural formation that will carry the energy of Selenite, but with additional metaphysical properties due to its golden essence. Golden (Ray) Selenite are powerful, beautiful, and high vibrational Crystals that have come to light calling in the highest frequency of white light and the Golden Ray of Buddha, some say, storing Ancient Priestess teachings and can be used for a variety of metaphysical purposes – making them excellent for any healing environment. 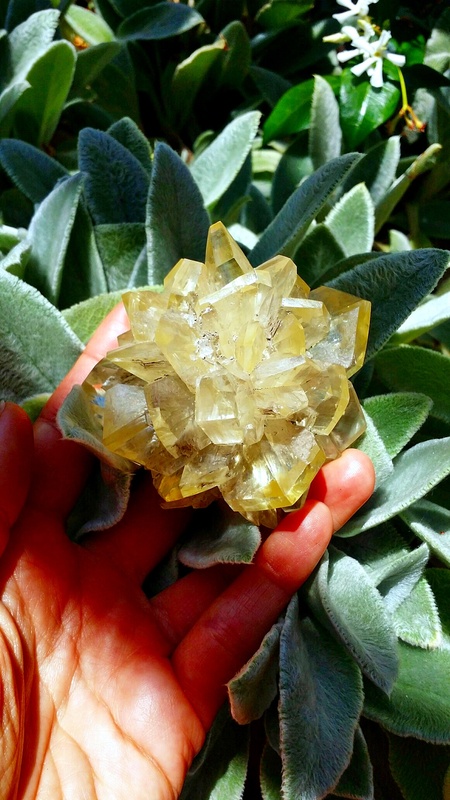 It connects to the Solar Plexus, Third Eye, Heart, and Crown Chakras, helping to integrate, open, and activate them. This supports us in creatively manifesting what is from our heart, directing our will in a loving, joyful manner. We are then able to create our reality based on intention, trust, and joyful wisdom. It helps you to become attuned to, and harmonized with, your soul purpose for this lifetime. Focuses are on joy, manifestation, and creation/creative energies and are really good for digestive issues and addictions, as the dis-ease of one’s will. 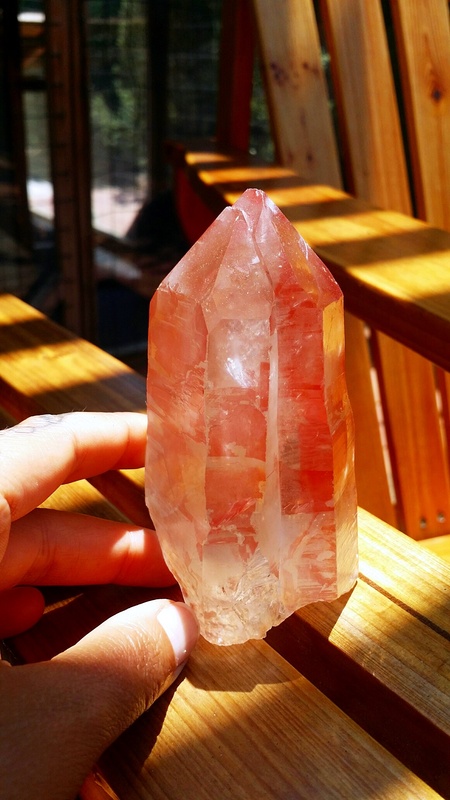 I’m just so enraptured by this Crystal. There’s something very much like home about it to me. Literally every time I pick it up I’m filled with chills, as mentioned. 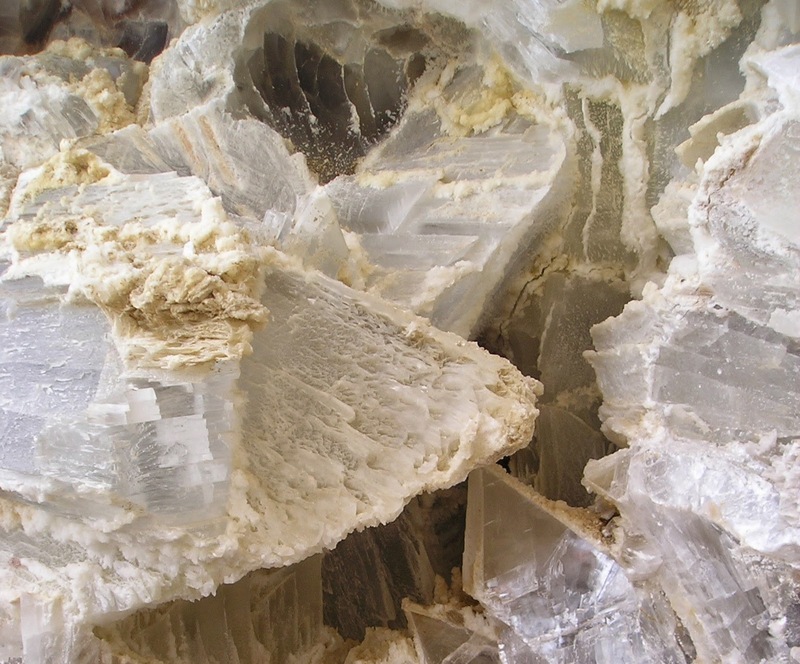 There’s something both inner Earth and Cosmic about it and no wonder as Selenite is an embodiment of “As Above, So Below”. The first night I slept with it upon arrival home, I had a very interesting dream in Egypt. I hope you enjoy exploring these Crystals and that perhaps with each piece I share, you might find something that speaks to you and maybe even a Crystal friend that might be calling. I find that once you have the intent to find a particular Crystal, it will find you! As I shared in my newsletter for this month, with things shifting so immensely in my own personal experience this creates a trickle down effect in all areas of my life. Things are accelerated to the point now that we are able to both release things and bring in the new simultaneously at rapid rates, without the two experiences being isolated. I’m very alert to energies and when the time is right to release things, I do so, but not too soon and not drawn out beyond windows of energetic alignment. There’s a lot of new percolating and taking form, but that is also tied into the old being shed with gratitude. 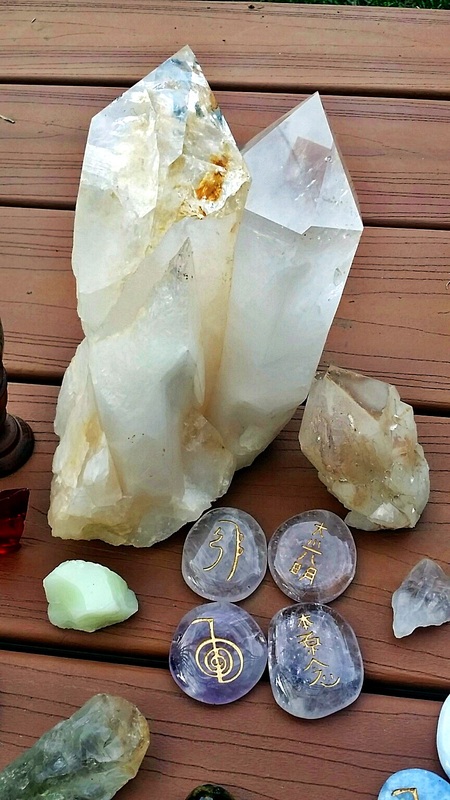 So, it became clear that one of those areas of letting go for me would involve releasing some of the Crystals from my own personal family collection that are ready to move on to assist others with the energy they have and to continue the work they are here to do. Some of this is because our work has come full circle, and some of this is reflective of the new I’m creating, which has drawn in new Crystals that have been joining me recently and shakes things up energetically. There are a few main-stay Crystals that seem to still be sticking it out with me as long-term partners (for now at least), which is fun to see how they put up with my shifts and mirror them, but nothing is permanent and I may see more moving on once I more fully activate new things. Some are moving on to my family, while others have already moved on to new keepers in the last couple of weeks, but for now this is the first group of Crystals (below) that are actively putting out energetic feelers for heart connections with whomever feels called to them. I promised several of you I’d have this up this week, so I apologize it took so long, but it’s been such a busy time for me. If you are interested in any of the Crystals please message me at tania@taniamarie.com. They are offered for sale, at or below cost, depending on what has been instructed by each. It’s vitally important to me that they get to the right guardians more than anything else. Being that my plate has been very full these days, this in part is why it took me nearly all month to finally post these, but is also why I won’t be sharing tons of photos and information on them. I am trusting that you will know if they are for you and if you are interested in more info, then you can message me. Some of these are available as stand alone Crystals and others have shared they want to go as groups, so the info on that is below as well. 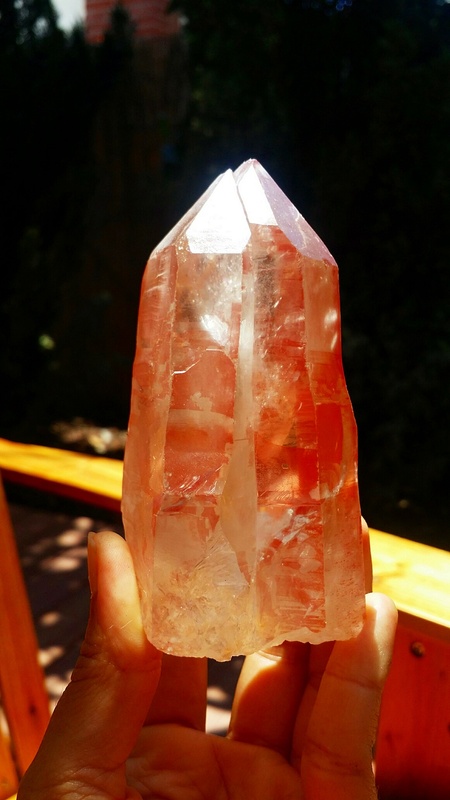 All of the Crystals have really special and very clean, focused energy and have done amazing work over the years for myself and in sessions for others. I will have them all cleansed, charged and programmed before sending off. Two pieces I learned of their moving on after I took the photographs, so you can message me if you would like more info. One is another Andara in addition to the two in the photo, which its info is shared below, and the other is an enchanting Crystal, Faery Tree SOLD – please message me if you would like photos and information. Please click on photos to enlarge for detail. Blue Topaz: (this one has amazing rainbows in it more than the photo shares) clears and activates throat chakra, enhances articulation of ideas and insights, magnifies psychic abilities, tune in to inner guidance, express your emotions and needs, promotes sharing and communication, learning and mental perception, calms mind for meditation, aids communication with higher spiritual beings, soothing. Green Amethyst: rare pale green amethyst, love and spiritual fulfillment, great for embarking on a spiritual journey or if wanting to find yourself, healing energy is entwined with the heart chakra and your emotions as well as the crown chakra, helps you to open your heart to the world, more love and passion will flow into your life, aids digestion by allowing your body to metabolize nutrients efficiently, helps with any issues related to the gastrointestinal tract, helps to flush toxins from the body, helps with your willpower when detoxing, attracts and promotes positive energy, removes blockages within your body’s energy points which allows the body to function at peak performance, heals the mind by strengthening your willpower, thought processes and allowing you to begin to self-love, helps you to recover from previous emotional upsets, let go of grudges and aid with general emotional healing, helps build confidence and become self-reliant, supports prosperity if having financial hardships, helps protect you from yourself, and like purple amethyst, helps you fight addictive urges and aids you in overcoming addictions. 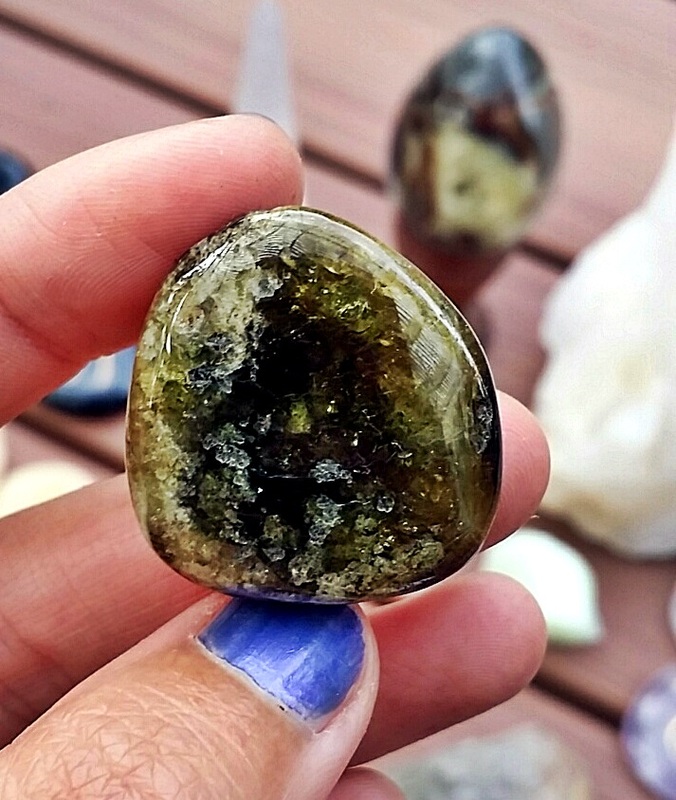 Green Garnet: powerful aid to the manifestation of prosperity and abundance in all earthly endeavors, gemstone of good fortune, activates the heart chakra, awakening compassion and charity, strengthens, purifies, revitalizes and energizes the body’s systems, aids the pituitary gland. 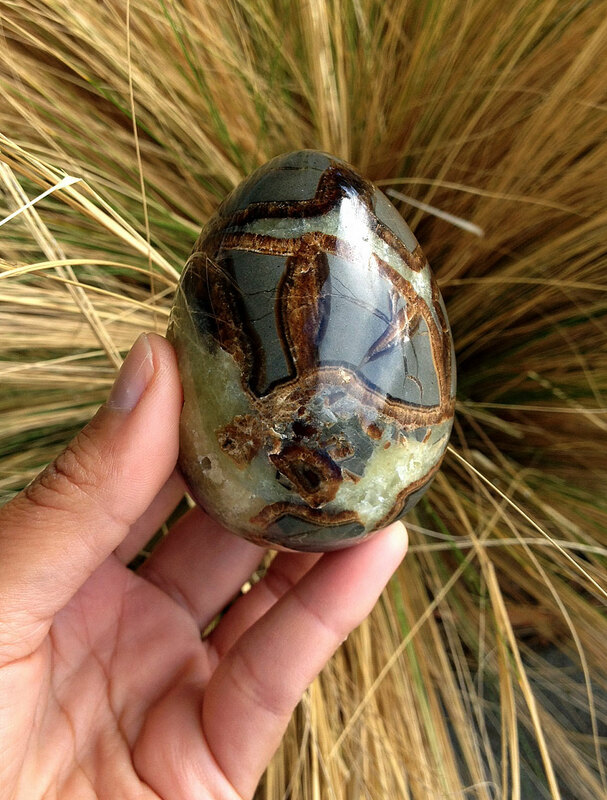 Septarian Cosmic Egg: Septarians were formed during the Cretaceous Period, around 50 to 70 million years ago, brings abundant emotional calming energies that have a nurturing feel to them, as well as are spiritually uplifting and joy-infusing, great for overall health and well being, enhance and nurture communication with groups (making it easier to speak clearly and compassionately in these settings), supports communication with Mother Earth, brings unconscious foreknowledge needed to keep you always prepared for what is coming, very protective and provide shielding and grounding of the physical, mental and emotional bodies while regulating spiritual, mental and physical courage, provides energy for merging with and amplifying your energies, helps you determine which direction to go, said to be a speaking stone that enhances all levels of communication. They LOVE to be held and emanate an energy pattern of sincere, loving kindness that is magnetic, connected to the three lower chakras, used for healing of the blood and kidneys, as well as strengthen teeth, bones, and muscles, resonate a very strong Earth energy that will help connect you to the Devic kingdom and their powerful Shamanic influence will strengthen group activities and response, helps strengthen the vibration of drumming and chanting circles, enhance the closeness of the group, and provide stronger focus on the task at hand, resonate strongly within the throat chakra and assist any public speaking focuses, helpful in maintaining privacy, as they seem to dispel unhealthy personal interest in you from others if that is something you desire and value support with, very strong healing stones that assist in self-healing, flexibility, and flow (especially mentally) as well as connecting with higher truths, helps you when you are unsure about how to approach a treatment when assisting someone or yourself, brings greater peace into you life, enhances insights and answers from mediation. 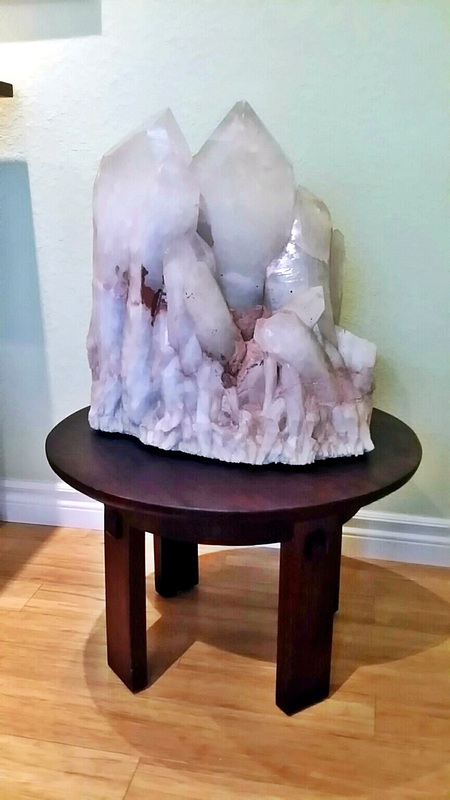 The beautiful table is available in addition to the Crystal, as you may need it to display since it is solid wood and sturdy enough to hold its weight. Message me if interested on pricing for both. This Crystal is only available for someone local or that can come pick it up by car. If you are in the Reno area, that may also be an option, as I will be driving up that way soon. 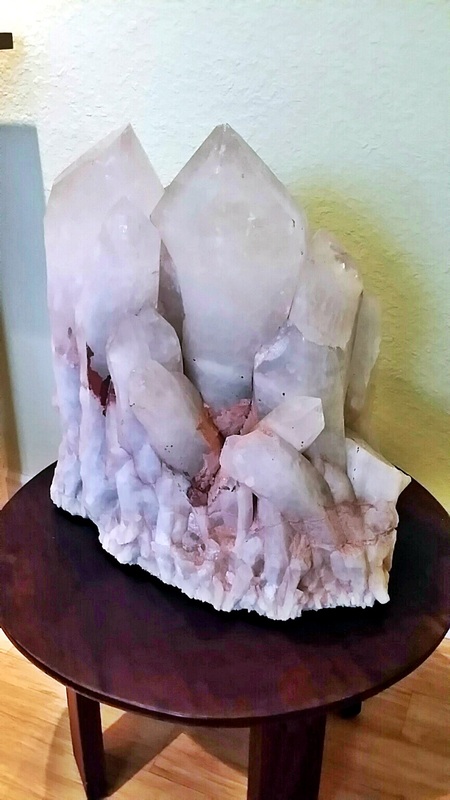 Please do not message about it if you are out of the area, international, or in another state, as this crystal would need heavy duty and expensive crating and shipping that I am not interested in spending the energy on and would be very costly, not to mention I’d worry about its safety in the process. 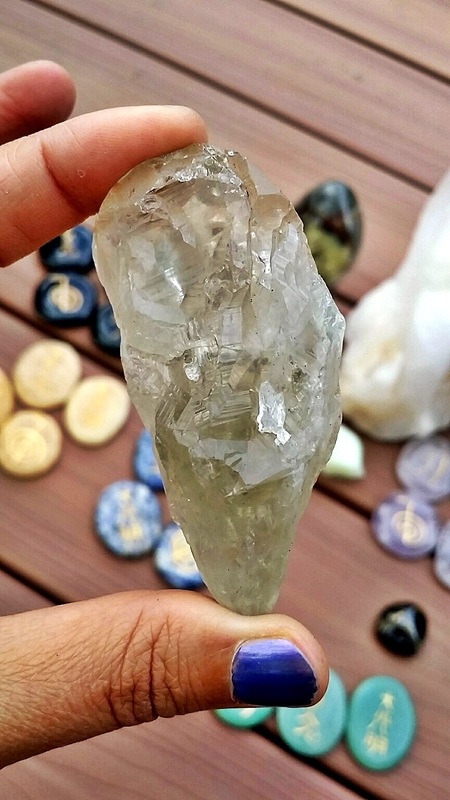 Lemurian Seed Crystals: are crystals that are reputed to have been seeded by the Lemurians – an advanced and peaceful, ancient civilization based on the consciousness of love and connection – to teach and guide us in this time. 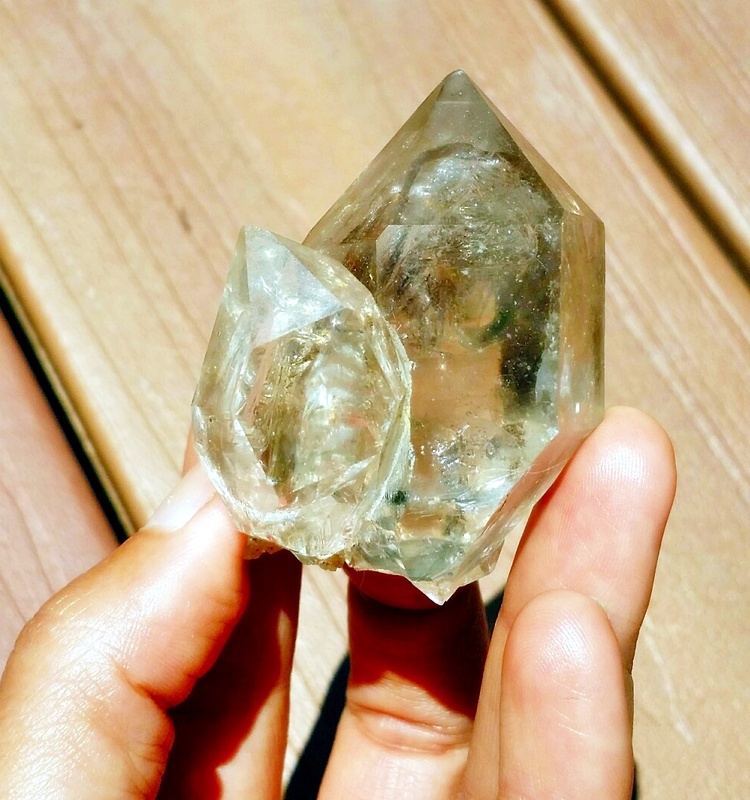 Lemurian Seed Crystals have been programmed to hold and transmit messages of unconditional love, conscious connection, and equality, while they assist us in remembering who we really are. They are very supportive, positive, and life affirming, as they enhance and encourage inner development and connectedness. They are also great for dream work and dream interpretation. Lemurian Seed Crystals have a very Yin or feminine energy, and for all their power are more gentle-feeling energetically than Yang/masculine crystals. 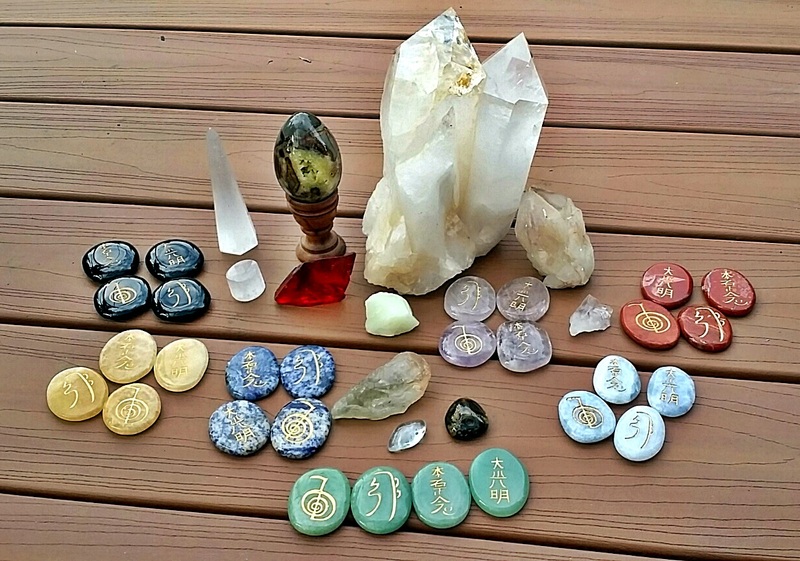 They are very powerful tools for meditation, healing on all levels, and are excellent for clearing and balancing all chakras. There are vast universes inside each Lemurian Seed Crystal that is home to many beings of light and unique spiritual information and wisdom, as they are connected to inner earth, the earth’s surface, and the stars. 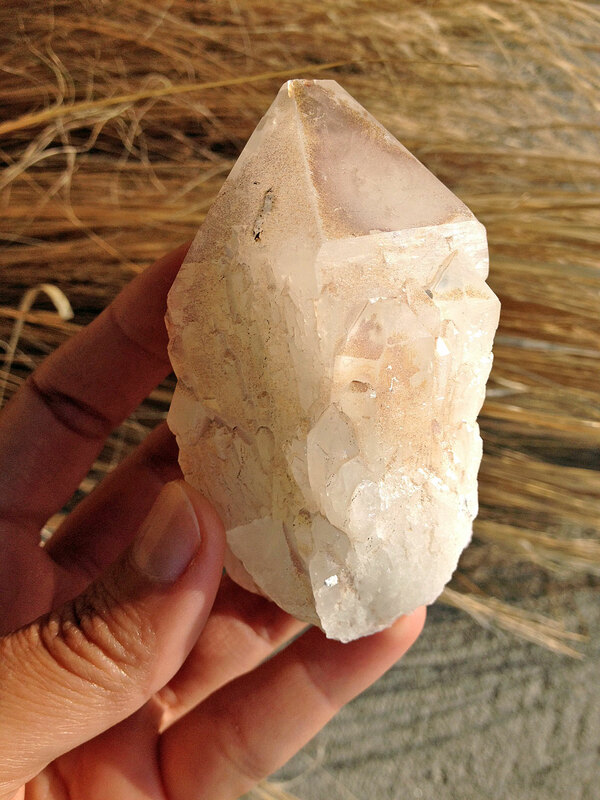 Lemurian Seed Crystals were planted in different areas of Brazil, millions of years ago, for the purpose of guiding a future generation toward healing enlightenment known of in ancient days. During the last days of Lemuria, it was decided to plant, or seed, crystals programmed to transmit a message of oneness. The Lemurian Culture’s center of consciousness was the emotional and spiritual dimensions of existence, unlike our modern world’s mentally based focus. They had a deep connection to the heart, which allowed the expression of unconditional love for the Divine and each other. Lemurian Seed Crystals also help us to maintain our connection with our spiritual source and teach us how to be both individuals and integral parts of the cosmic design. This is mirrored by each seed crystal’s energetic connection to all other seed crystals, while on the individual level, simultaneously doing its own work to pass forth their knowledge and programming for the earth, in preparation for the transitions and shifting changes in consciousness. There comes a responsibility, to honor and work with, when you and your Lemurian choose one another.